The Historic Veale Ranch is a very rare offering, available to only the best of land stewards and most savvy investors. This large working cattle ranch is unique because of its size and location in the area, and the ranch gate is only 11 miles west of downtown Fort Worth! Seldom does a ranch of this magnitude come on the market in the DFW area. The vistas are stunning, rolling plains are mesmerizing, and the future opportunities are limitless. Full details on this listing can be found also on Lands of Texas property ID: 4634651. 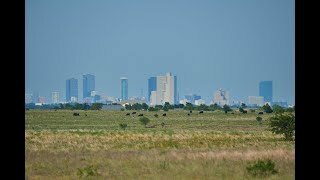 The ranch is in both Parker and Tarrant counties.